In 2011, ATZ’s feature for Games Magazine on places where you can play vintage pinball year round included the then-new National Pinball Museum in Washington D.C. The museum showcased some of the more than 800 games from founder David Silverman’s 35-year collection, including a 19th century pinball precursor, vintage woodrail games and modern, solid-state machines. The museum, which later moved to Baltimore, closed its doors after losing its lease again last year. In August, Silverman told the Baltimore Sun that without investors coming to his rescue or a reasonable long-term lease, he’d have to sell off his pinball machines. Silverman’s collection is now up for auction in a series of sales at Morphy’s Auctions starting with a February 21 sale that includes 75 machines. Pre-sale estimates range from $600 to $3,500. Highlights within the introductory grouping include Lot 13, a 1950 Gottlieb Bank A Ball, with a $2,500-$3,000 estimate; Lot 15, a Gottlieb Sittin Pretty, $2,500-$3,000; Lot 17, a Gottlieb Knock-Out, $3,000-$5,000; and Lot 66, a Bally Revenge From Mars, $3,000-$3,500. Online bidding is available via the Pennsylvania auction house’s website and live auctioneers. 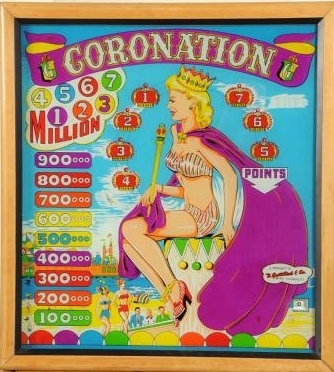 Some of the games took their inspiration from historical events such as a 1952 Gottlieb Coronation Pinball Machine released in anticipation of the crowning of Queen Elizabeth II which took place on June 2, 1953. Pop culture phenoms also gave birth to pinball machines. The TV show “I Love Lucy” became the 1954 Lovely Lucy Pinball Machine. 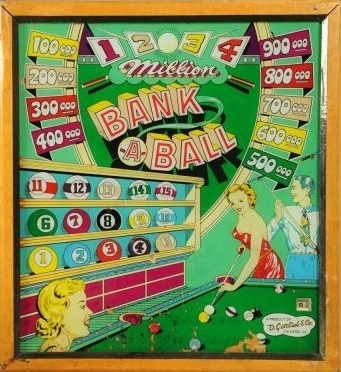 Both Coronation and Lovely Lucy feature original backglass and playfield art by Leroy Parker, whose work emblazoned Gottlieb machines for more than 30 years. 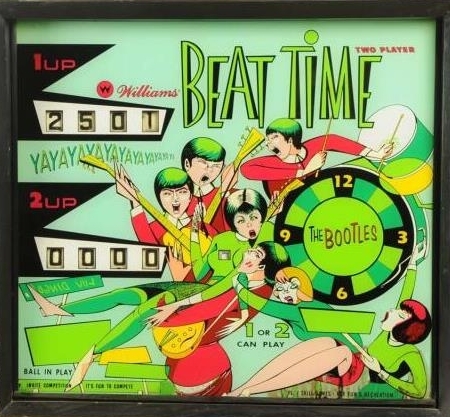 On the 50th anniversary of the Beatles, let’s not forget Williams Beat Time Pinball Machine (1967), a Beatles-themed game that was called the Bootles due to copyright laws. Yeah, yeah, yeah! Day two of Morphy’s April 26-27 auction will open with the company’s second offering of pinball machines from the 35-year David Silverman collection, previously displayed at the National Pinball Museum. Film-related machines lead the grouping, with a 1993 Williams “Indiana Jones” pinball estimated at $6,500-$7,500; and a 1992 “Creature from the Black Lagoon” with fantastic artwork by Kevin O’Connor, expected to reach $4,500-$6,000. 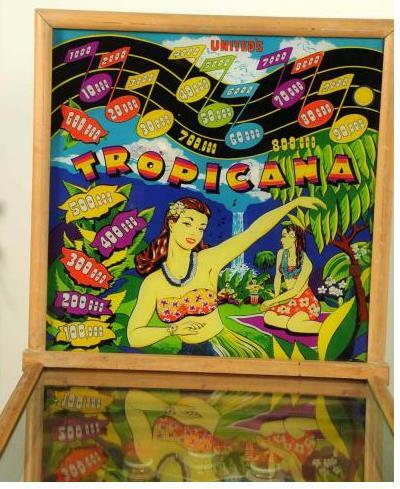 Other notable lots include two Gottlieb pinball machines: a rare, low-production 1950s “Buffalo Bill,” $2,000-$2,500; and a 1952 “All-Star Basketball,” $1,500-$2,000. Bidding is available online via Live Auctioneers. I am very sorry to hear of this news about the Baltimore Pinball Museum games being auctioned. It is ONLY through the support, through patronage, that such places can continue to operate, as they have operating expenses just like any other business, unless they are subsidized in some way. Yet somehow, even those who love playing the games, often resent paying the rather small fees for admissions to the Museum, and support the cause. The result of which ends up with the closing, and sometimes, the auction. I have personally faced these realities in operating my Amusements Museums going back to my first one in 1996. I learned that the real customers are those who just happen through your doors; they are there ONLY for the purpose of having fun. It is all about location, and operating costs. As I see myself entering my final chapters in life, my imperative goal has become to focus upon getting all of my collected treasures set up in some kind of foundation where they will live on beyond my years. Although all these things are my history, it is a shared history with everyone else, and the world is in serious need of reminders of when people had simple family fun. In effort to avoid the eventual estate sale, and/or auction of my massive collection, I would consider donating it all under the proper circumstances. In this way, the quest of preservation will be fulfilled, and so, my purpose. Hats off to Mr. Silverman for his dedication to have preserved his collection over the years, and to have made several attempts to share it with the world…. I am very much saddened that it seems to end up in this fashion. Thank you, Randy. You’re very eloquent. I wish we could get a Pinball Museum AND a Fascination Parlor in Coney, but unfortunately the rent has skyrocketed. In a place that once used to have many stand-alone arcades, open year-round, there are now only three– at Deno’s Wonder Wheel Park, Luna Park, and the Eldorado, open during the season. Yes indeed, Coney has lots of history and the historical foundation for such as Fascination and Pinball…..
Perhaps, if those behind the “development” come to realize what an addition such “attractions” as these would be, then they could, and would appear. Imagine The Coney Island Amusements Museum…. A HUGE, hands on “museum” of Amusement devices and artifacts from generations ago. Educational for school systems all over the tri-state area and beyond, not to mention a fantastic reason for anyone to come to Coney Island ! This plan would work in ANY area which desires to put themselves on the map, and soar into financial development, and with such a plan, and foundation, I would consider supplying most everything required. Ideally, it should be government run, however, non-profit organizations could fit the bill as well as large for profit resorts seeking entertainment attractions to serve as reason to come to the resort. Disney would be perfect to carry such a spectacular, and I did in fact write to Disney offering the plan and such a donation; sadly my letter was returned as they will not review “unsolicited ideas”. New Jersey, which has been so dedicated to so many boardwalk areas, would be a natural as well, and I did propose it to the Governor, who responded that they will review all ideas. That sounds like the Mechanical Museum in San Francisco. I love that place! On a grand scale ! Fun, educational, and History all in one ! My hope is to make it happen while I am still alive and well enough to do it…. time stops for no man….